Oh, we had a lovely weekend last week. Great food, lots of exercise cycling and golfing, and the serendipitous disc overy that our old local, The Albion in Wickham, had morphed into a boutique beer pub. And better still, is one of the venues for Newcastle’s upcoming Craft Beer Week. Yup, we’re grabbing some friends and heading back. Besides boasting a gorgeous harbour, brilliant beaches and a great atmosphere, Newcastle is also home to some fantastic pubs and restaurants. 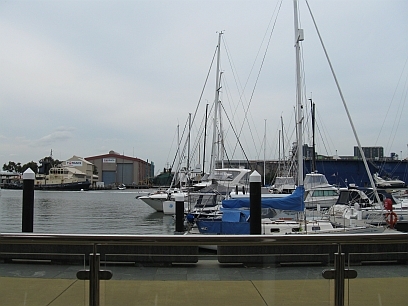 One of my favourites is Rocksalt on Newcastle Marina, and that’s where we headed for lunch on Saturday. 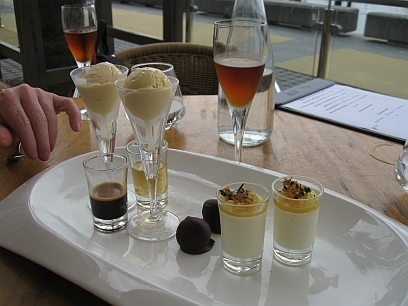 At the risk of sounding like a gigantic ad, if you happen to be in Newie and on the hunt for a great restaurant with a fantastic view, then take a look at Rocksalt. And afterwards, why not wander across the road to the Albion for cleansing craft beer. 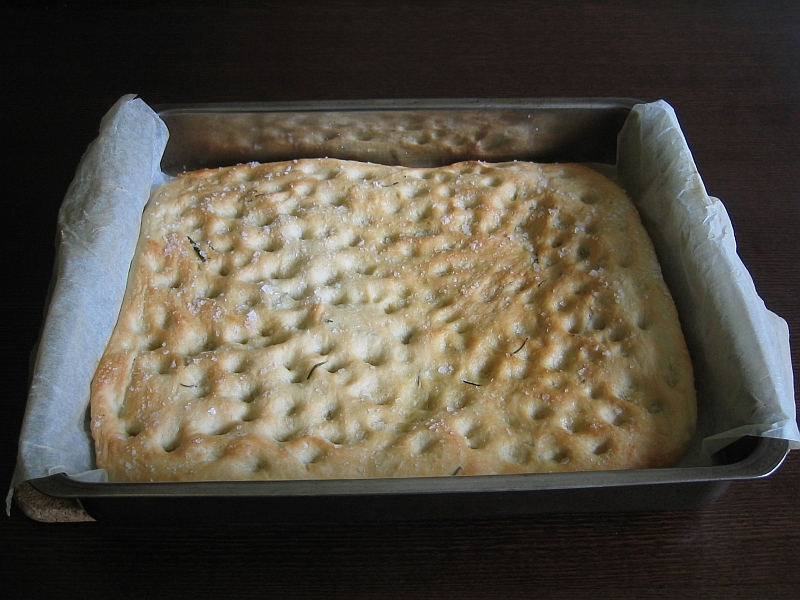 Now, all this talk of rock salt has made me think of my favourite focaccia recipe. I swear, this one is not only delicious, it’s fool proof. And if your mixmaster has dough hooks, whack it in there to knead and you won’t even have to raise a sweat. Then kick back in the sunshine with some olives, salumi, maybe a dip or some grilled vegetables, and the aperitif of your choice, and enjoy. Ahh, spring. I love you. *As an aside, I actually dislike people taking photos of restaurant food as I think it’s bad manners and a bit disrespectful, but this was so good I couldn’t help myself. Yeah, yeah, I’m a hypocrite. Sift the flour, salt and yeast into a large mixing bowl and stir in half the rosemary. Make a well in the centre and add almost all of the water and the olive oil. Gradually mix the flour into the liquid, adding some or all of the remaining water if necessary to form a soft dough. Turn the dough out onto a lightly floured surface and knead for 10 minutes until smooth and elastic. Place the dough into a clean, lightly oiled bowl, cover with cling wrap and leave somewhere warm for 1 – 1 ½ hours or until doubled in size. Cut out a piece of baking paper to fit the base of a 30×40 cm shallow baking or roasting tray. Put the baking paper on the work surface. Tip out the dough onto the paper and press it into an even layer to cover the paper. Lift the dough and paper into the tin, cover loosely with cling wrap and put in a warm place for another hour until doubled in size. Preheat oven to 240º C or as high as your oven will go. Uncover the dough and drizzle with a little more olive oil. Scatter the remaining rosemary leaves (optional – I don’t bother, the mix has enough in it) and the rock salt, and push your fingertips into the surface of the dough to form dimples. Bake 15-18 minutes until golden brown. Remove and leave to cook on a wire rack. 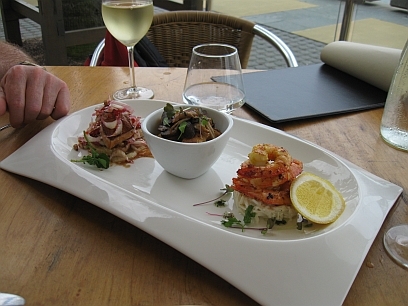 This entry was posted in Friday Feast and tagged Food, Friday Feast, Recipes on November 4, 2011 by cathrynhein. This really does look like a feast! Hey, Frugal, I just checked your blog out. Fan-bloody-tastic! And, yes, it was a feast. We fair waddled away. Still had enough room for a few beers, mind. Rocksalt is one of my favourite places too. Haven’t been there in a while and you’ve inspired me to pick up the phone and make a rezzo. Also, thanks for the ‘follow’ on Barefoot in Newcastle! Hi Martina, and thanks for dropping by. I really enjoyed poking around your blog! Rocksalt is definitely worth another visit, also East End Enoteca which we tried for the first time on Friday night. My dining companions and I can be a bit tricky to impress but we all agreed it was sensational. Really interesting (and delicious) food and a fantastic wine list. Next stop Bocados Spanish Kitchen. Assuming we can get in. I hope it’s popularity is a sign of great food and not just because tapas is so trendy at the moment.